Even in the company of other vicious diseases, pancreatic cancer is particularly nasty: The one-year relative survival rate is 20% and the five-year rate is 7%. It ranks third in cancer-related deaths in the United States, and it is expected that over 55,000 Americans will be diagnosed this year alone. It is deadly because it is stealthy. While testicular cancer presents with a lump and skin cancer with a lesion, because the pancreas is buried so deeply within the body, the initial signs of pancreatic cancer are often overlooked or misdiagnosed. November is Pancreatic Cancer Awareness Month, and the overall message is for the populace to not take mysterious symptoms lightly. That “advanced state,” she explains, most often announces itself as a yellowing of the skin and eyes, a condition known as jaundice. A tumor in the head of the pancreas can cause narrowing of the bile duct and block the bile (a fluid that aids digestion) flowing from the gallbladder and into the small intestine. Blockage of the duct causes a buildup of bilirubin, an orange-yellow pigment formed in the liver by the breakdown of hemoglobin and excreted in bile that then leaks into the body, causing the discoloration. It is at this point, however, that the cancer has begun to spread and is in its deadliest stage. But this only after a host of far less obvious clues become manifest: belly or back pain, diabetes, nausea and vomiting, uneven fat distribution, poor appetite and weight loss. The key, says Manax, is how quickly these signs present, how long they persist and how dramatic they are. For example, a person’s weight will naturally oscillate from month to month, but a sudden drop of 15 pounds or more for no apparent reason is cause to see your doctor. Manax is quick to add, however, that while the signs and symptoms of pancreatic cancer are surreptitious, its risk factors are not. “Age (the average age for a diagnosis is 71), family history, if there is an incidence of chronic or hereditary pancreatitis, smoking, obesity and long-standing diabetes—these are the more familiar risk factors for developing the cancer,” she says. Manax is alluding to the fact that “pancreatic cancer” is actually an umbrella term, for there are several different kinds of the disease. 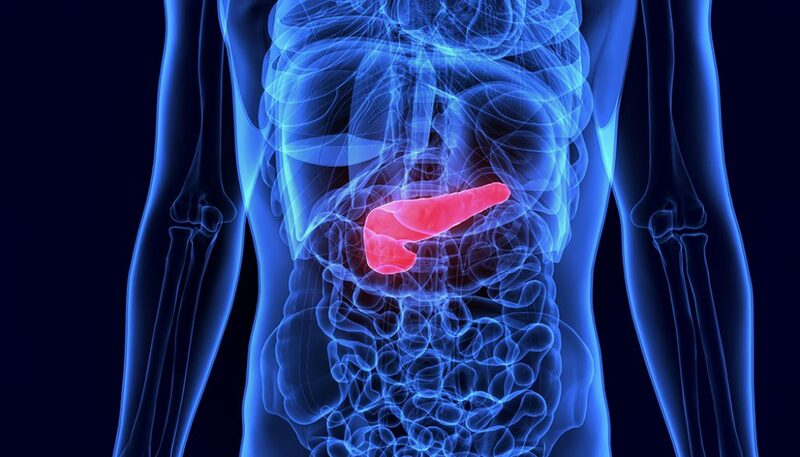 The pancreas is primarily composed to two types of cells, exocrine cells that help with digestion, and endocrine cells that are responsible for insulin production. About 95% of cancers of the exocrine pancreas are adenocarcinomas, usually starting in the ducts of the pancreas. Tumors of the endocrine pancreas are far less common, making up less than 5% of all pancreatic cancers. As a group, they are often called pancreatic neuroendocrine tumors or islet cell tumors, and some of this type can, in fact, be benign (but whose cells can be practically identical to a cancerous one under a microscope). Along with Manax and PanCAN, the National Foundation for Cancer Research (NFCR) also makes pancreatic cancer a focus. Two currently funded NFCR scientists, Daniel Von Hoff, M.D., and Laurence Hurley, Ph.D., are working at the genetic level of the disease, seeking ways to use the body’s DNA to suppress tumors. Another recently funded NFCR physician, Yung-Chi Cheng, Ph.D., has explored the therapeutic properties of PHY906, a Chinese herbal medicine formula. When combined with chemotherapy, PHY906 alleviates the unpleasant gastrointestinal side effects of chemotherapy for pancreatic, colorectal and liver cancer patients. There is evidence PHY906 may have antitumor properties, as well.